Blanching represents the start of peanut processing for further use, removing the peanut’s red skin, which can be considered bitter tasting. Most often the heart is also removed. Once completed, the cleaned nut is ready for further processing into a nut butter or paste, or granulated into sizes suitable for products ranging from prepared meals to baked goods or ice cream toppings. In any instance, the best blanching equipment will not only ensure thorough skin removal, but also accomplish this with minimal product shrinkage, to protect your company’s profitability. Finished product integrity begins with the right equipment. AC Horn Manufacturing split peanut blanchers offer manufacturers a system that swiftly and thoroughly removes the nut skin for an impressive product throughput. 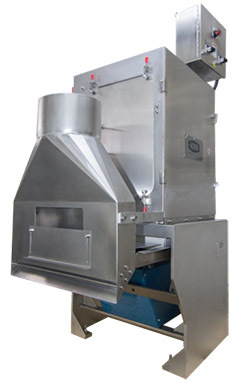 We know that a chief concern is blanching efficiency and our split nut blancher is designed to deliver optimal blanching efficiency on a first pass. Our machines use soft, rubber-covered components to process or blanch the nuts. This generates less waste, requiring less clean up and improving process sanitation. Our blanching process, by design, reduces product shrinkage. By decreasing product waste and delivering maximum blanching efficiency, Horn peanut blanching equipment improves profit margins for operations both large and small.